Home / Holidays/Celebrations Art / Mother’s Day Card Using Bouquet, Lg. Mother’s Day Card Using Bouquet, Lg. “Bouquet, Lg.” was stamped with a black Memories pad vertically and horizontally, colored with markers and cut out. Two additional daisies were stamped, colored and cut out. These cut-outs were assembled on a white card that has 1″ cut from the front. The cut edge is edged with a gold Krylon Leafing pen, and the flowers are glued on the card so that two of them overlap the cut edge. A polka dot piece of scrapbook paper is glued to the lower part of the inside of the card. 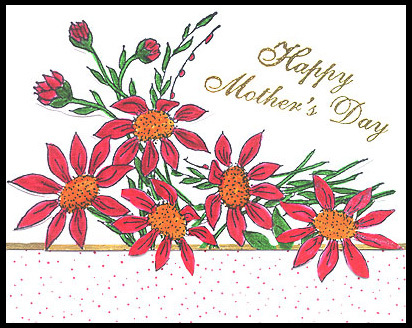 “Happy Mother’s Day” was stamped and embossed with gold embossing powder on the white card stock. Card by Judy Conklin. Next post: Mother’s Day Card Using Rose Fan, Lg.